What is it about slipping on a pair of Dini’s flip flops that feels so amazing? Is it the freedom, the ease, the comfort or the style? I can’t choose. Maybe it’s everything. 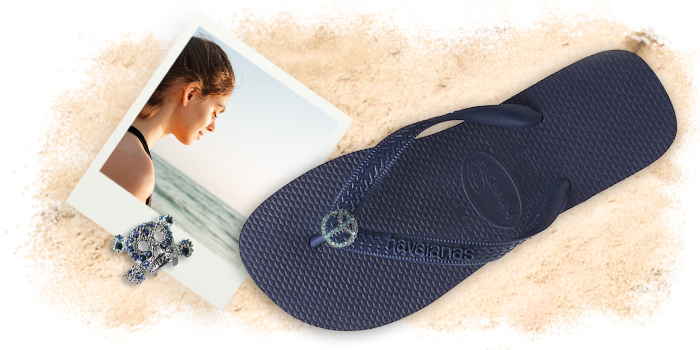 Can you imagine going to the beach without a pair of your favourite flip flops? No, me either. They are absolutely perfect. They protect the soles of our feet from the scorching sands, while our tootsies get a refreshing exfoliation at the same time. It’s nature’s own foot treatment! Just the ease of popping on a pair of flip flops makes them so liberating and convenient! Perfect for wearing around the house, popping out to grab a coffee, running an errand or, perish the thought, taking out the trash. Urgh. A chiropodist friend of mine swears by the phrase, ‘Happy feet, happy body’. She’s right. Our feet are hugely important parts of our body, so it pays to look after them. Flip flops let the air circulate around them so that they can breathe. They also keep your feet dry – great news if you’re recovery from a foot condition. Whether it’s sand from the beach or grass from the park, flip flops are a breeze to clean. Step into the sea or run under the water and they’re immaculate again. Here’s a bit of psychology for you… Flip flops are made for comfort and relaxation. So when we wear them our brains switch to ‘play’ mode. We feel more peaceful and happy. So there you go. Flip flops are not only stylish but good for your body and mind too. It’s practically scientifically proven. You can find out about all our ranges, including new arrivals, here.